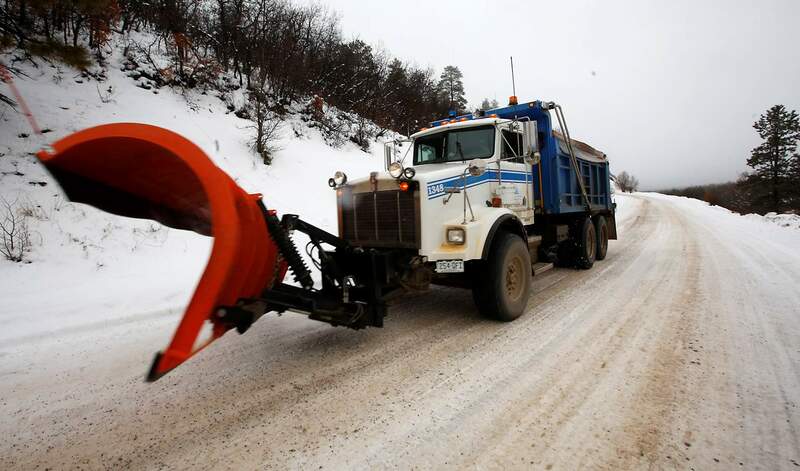 A La Plata County snowplow spreads gravel on an ice-covered County Road 125 south of Durango last Monday. One Action Line reader wants to know why snowplows are out when it’s only raining. Sitting here watching the weather, I was confounded to contemplate rain in Durango in January. Then, lo and behold, I witness something even more confounding – a city snowplow drives by, sparks flying, as it “plows” the rain. I’m confused. What little snow we received was long gone due to high temperatures and showers. Then the plow goes by with sparks flying again – a total of five times in the past two hours. Action Line feels your angst and befuddlement. This is Durango, not Seattle. We’re supposed to get light and fluffy snow, not heavy and drizzly rain. It’s a good thing that so many politicians and non-scientists have assured us that there’s no such thing as global warming. Otherwise, we ought to be concerned. So we got that climate thingy covered. Phew! Nevertheless, the weather is getting to people. The gray is making folks blue for the lack of white stuff, and seeing red when so much green is spent on plowing blacktop. Hue betcha! Silence is golden. But in the case of pavement and precipitation, it’s not a black and white issue. That’s from our good friend Dean Brookie, city councilman and former mayor. Action Line ran into Dean the other night and piqued his perspective on precipitation preparedness. “When snow is in the forecast, the city pays plow drivers to be out there regardless,” he said. Dean couldn’t address the specifics of an individual plow, but he did point out that on the day in question, last Monday, the National Weather Service had issued an ice storm warning that morning. Action Line has never seen an ice storm warning for Durango. Not in well over 30 years. Again, good thing there’s no climate change. “My hunch is that the plow driver was trying to remove slush off the road so it wouldn’t freeze if the temperatures fell. But that’s just a guess,” Dean said. On roads higher than 6,700 feet that day, pavement turned into ice rinks, thereby causing drivers’ IQs to match outside temperatures. But here in the city, we dodged a bullet. According to the National Weather Service, the coldest we ever got was 34. So yes, persistently plowing precipitation might not represent best practices. But remember the bad old days when the city would try to save money by not plowing? Action Line recalls a couple of winters back when it snowed heavily on Christmas Eve, New Year’s Eve and again during a Broncos’ Super Bowl. There wasn’t a snowplow to be seen on any of those storm events. Plows came the following days, but it was too late. Traffic created foot-deep compression ice and ruts. It was absolutely ridiculous. Making things worse, the sun (or as the city calls it, “the solar plow”) never came out. Instead, we got cloudy days just warm enough to melt the top skin of ice only to have it refreeze solid each night. Call it the Zamboni Effect. By then, the private contractors with front-end loaders and whatnot were hired, no doubt at a rate many times greater than paying staff holiday overtime. So if some “mixed precipitation” gets plowed, big deal. It might cause some different kinds of sparks to fly, but Action Line is singing in the rain. Email questions to actionline@durangoherald.com or mail them to Action Line, The Durango Herald, 1275 Main Ave., Durango, CO 81301. You can ask for anonymity if you can rein in the reign of the rain.